When it comes to weddings, every couple has a budget - & that’s smart! Unless you’re a king or something, chances are you don’t have an endless cash flow. This is not to say you should find the cheapest people, it’s to make sure you pay your top priority people first and let the rest fall where it may. So, the money WILL run out. How do you even begin to build a budget for what you do have? YOU MAKE A LIST OF PRIORITIES :) You list out the most important things first and work your way down the list. You put money towards your top priorities first and secure your favorite people for your wedding date. Then if it comes to the less priority items, it’s ok that you don’t have much to put towards them (if anything at all) because it wasn’t that important to you. For example, if an epic venue is your top priority then put a retainer down for it to reserve your date first. Because if you spend money in all these other small areas and then start searching for your epic venue, you might be disappointed to find out that you can’t afford it because you’ve spent money on less prioritized items first. Or, if photos are extremely important to you then put money towards reserving your photographer before anything/one else, because you don’t wanna come to the end and have to hire a sub-par photographer for a wedding you just spent a lot of time &/or money planning! Obviously we’re biased ;), but photographs are going to be the only tangible thing you have after your wedding day. To remember all the details, the views, the planning, the food, and most importantly: moments with your favorite people. If you’re like us and wanna keep things simple & don’t have lots of money to put towards a wedding, then you hire an amazing photographer to make sure you remember it all. Rent out a vrbo or airbnb (like Libby & Pete), get married on the beach or a nearby lookout, then head back to your rental for a mini reception and meal by a private chef. That’s what Amy & Danny did, and it was b-e-a-utiful. 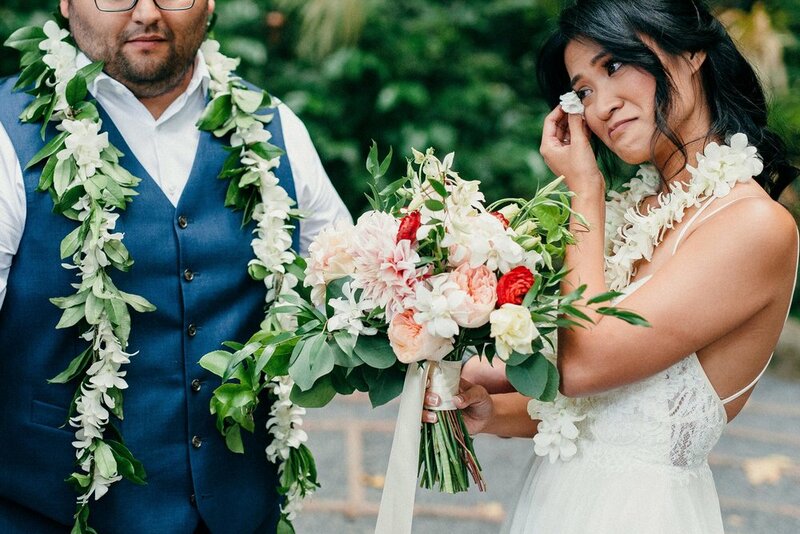 Check out this blog post to see a breakdown of costs for getting married in Hawaii and how the people we serve are amazing at making sure they get awesome photographs that tell the beautiful truth of the day they eloped to Hawaii.